The parsonage protected stands, like in a cascade cave. The farm Åkernes is first mentioned in 1603 ("Ackernes"), but it is probably from the Middle Ages. The Norse form must have been Akrnes, a compound of akr ('field; acre') and nes 'headland'. The farm was later divided into three parts: indre ('innermost'), ytre ('outermost') and midtre ('middle'). The form me is a shortened form of midtre - and the meaning of Me-Åkernes is 'the part of the farm Åkernes in the middle'. The farm is on a ledge about 100 metres (330 ft) above sea level on a steep avalanche-threatened hillside. Thus the five farm buildings are built against the rock face of a protected overhanging cliff face in the hillside, and the roofs are level with the slope, such that avalanches pass over the buildings without harming them. The only access is from the Storfjorden waters below; access from the ridge above is extremely difficult. There is no natural harbour on the shore, just a small man-made landing place and some remaining stone walls that are remnants of an earlier boat shed. The boats were dragged onto dry land for safekeeping from the seas from the fjord. The main house is where it is least exposed to avalanches. The hay barn and cowshed are added onto opposite ends of the house, for a total length of 35 metres (115 ft). The Me-Åkernes farm is, except for the unusual adaptation to the terrain and accommodation for danger from avalanches, a typical multi-activity farm representative of the fjord and mountain farms of the Sunnmøre district. The farms had to base their economy on agriculture, fishing, and hunting. Me-Åkernes was originally a single farm, but in 1881 its fields were divided in halves between two related couples. The house and farm buildings were shared in common, but each couple maintained their own livestock. There could be as many as 12-14 people living simultaneously at the farm. Each family would support livestock of four cattle and 40 sheep by supplementing fodder in the winter season by use of seaweed. The seaweed was treated in warm water, minced, and barley flour added. Although recently they grew potatoes and barley, a field area named "Rugåkeren" (the Rye Field) indicates that rye was grown there in earlier times. To thresh the grain they used a manual threshing machine. 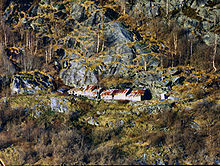 Today the farm is, due to its location by the Åkernesrenna (the Åkernes crevasse), at considerable risk. The Åkernesrenna has in the recent years widened at an accelerating rate, and analyses show the threat of a coming landslide, estimated at 50 million cubic metres (65 million cubic yards with latest estimates of up to 100 million cubic metres or 130 million cubic yards). The landslide will go directly into the fjord, causing a flood wave (landslide induced tsunami) of about 30 metres (98 ft) in height, which will sweep the fjord and devastate the areas adjacent to Sunnylvsfjorden and Storfjorden. Kitchen interior, preserved as it was when vacated in 1958. From the rally of Storfjordens Venner in June 2003. Åkernes, Me-Åkerneset headland, the farm in the lower part to the left in the hillside. The pink line identified the Åkernes crevasse. ^ a b c Ansok, Sakarias (1973). Far etter folk (in Norwegian). Stranda Sogenemnd. ^ a b c d "The 2004 Norwegian nomination for World heritage sites" (PDF). Archived from the original (PDF) on 2007-09-28. 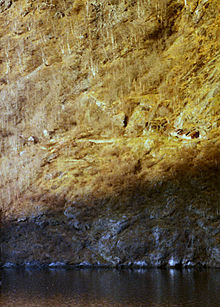 ^ "Åkernesrenna, Giant landslide in Storfjorden" (in Norwegian). Archived from the original on 2007-03-13. Retrieved 2006-12-01. ^ "The Wave (2015) Bølgen (original title)". IMDb. Retrieved 16 March 2016.